In response to high ridership demand along the Otay Mesa border area, the Metropolitan Transit System purchased and started operating large 60-foot articulated buses to supplement standard 40-foot buses during peak commute hours on Routes 905 and 950. The first articulated bus began operations last week, and a total of 10 will be introduced in the coming month for service in the South Bay area. The new 2017 XN60 low-floor buses manufactured by New Flyer, let MTS increase its capacity to transport riders along popular routes in the South Bay. The new buses will nearly double the number of passengers carried to about 100, allowing the agency provide extra seating and more comfortable rides. Routes 905 and 950 operate between the Otay Mesa Border to the Iris Avenue Transit Center. They are popular among cross-border commuters who connect from the Otay Mesa Port of Entry to the UC San Diego Blue Line Trolley. Route 905 runs every 20-30 minutes most of the day with multiple stops through the business corridor and some neighborhoods. Route 950 is an express route that runs approximately every 10-20 minutes during peak commute times. Routes 905 and 950 served 857,415 passengers in FY 2017 – a 25 percent increase over just 4 years ago when the routes served 682,830 passengers in FY 2014. 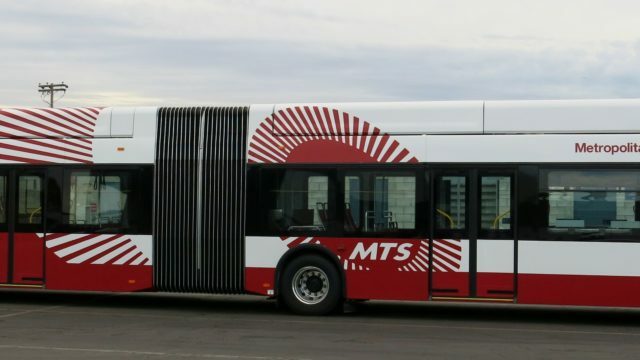 MTS operates 95 bus routes and three Trolley lines on 53 miles of double-tracked railway. Every weekday more than 280,000 passenger trips are taken on MTS bus and Trolley services in 10 cities and the county. In FY 2017, MTS served more than 88 million riders. For more information on how you can use public transportation and save money, go to www.sdmts.com.